A tendon is a band of tissue that connects a muscle to a bone. 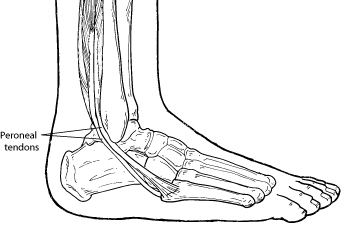 The two peroneal tendons in the foot run side-by-side behind the outer ankle bone. One peroneal tendon attaches to the outer part of the midfoot, while the other tendon runs under the foot and attaches near the inside of the arch. e main function of the peroneal tendons is to stabilize the foot and ankle and protect them from sprains. or chronic (developing over a period of time). They most commonly occur in individuals who participate in sports that involve repetitive ankle motion. In addition, people with higher arches are at risk for developing peroneal tendon injuries. Basic types of peroneal tendon injuries are tendonitis, tears, and subluxation. for pain, instability, swelling, warmth, and weakness on the outer side of the ankle. In addition, an x-ray or other advanced imaging studies may be needed to fully evaluate the injury. e foot and ankle surgeon will also look for signs of an ankle sprain and other related injuries that sometimes accompany a peroneal tendon injury. Proper diagnosis is important because prolonged discomfort after a simple sprain may be a sign of additional problems. • Immobilization. A cast or splint may be used to keep the foot and ankle from moving and allow the injury to heal. • Medications. Oral or injected anti-inflammatory drugs may help relieve the pain and inflammation. • Physical therapy. Ice, heat, or ultrasound therapy may be used to reduce swelling and pain. As symptoms improve, exercises can be added to strengthen the muscles and improve range of motion and balance. • Bracing. The surgeon may provide a brace to use for a short while or during activities requiring repetitive ankle motion. Bracing may also be an option when a patient is not a candidate for surgery.